Plugin Organizer is a plugin that I developed to help with a project where plugins were conflicting with each other. It has grown much farther than that since it’s initial release. Plugin Organizer can be very difficult for inexperienced wordpress users to comprehend. But if you take the time to set it up correctly using the FAQ and documentation pages your site will see a significant benefit in load time and resources used. It allows you to change the load order of your plugins and decide which ones load on each page. If you need one plugin to load before another or to only load one on specific pages then this is the plug in to do it. To download the plugin please go to the WordPress plugin page. 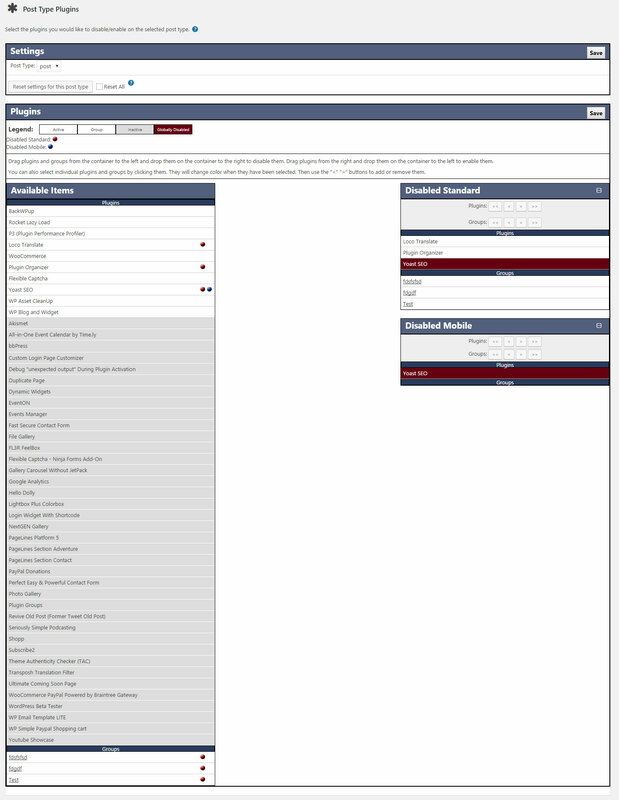 This is a screenshot of the Group and Order plugins page. Here you can change the load order of your plugins by dragging and dropping them in the order you want them to load. You can also add the plugin in the list to plugin groups. Those groups can be used on the various pages to disable plugins by selecting that group. 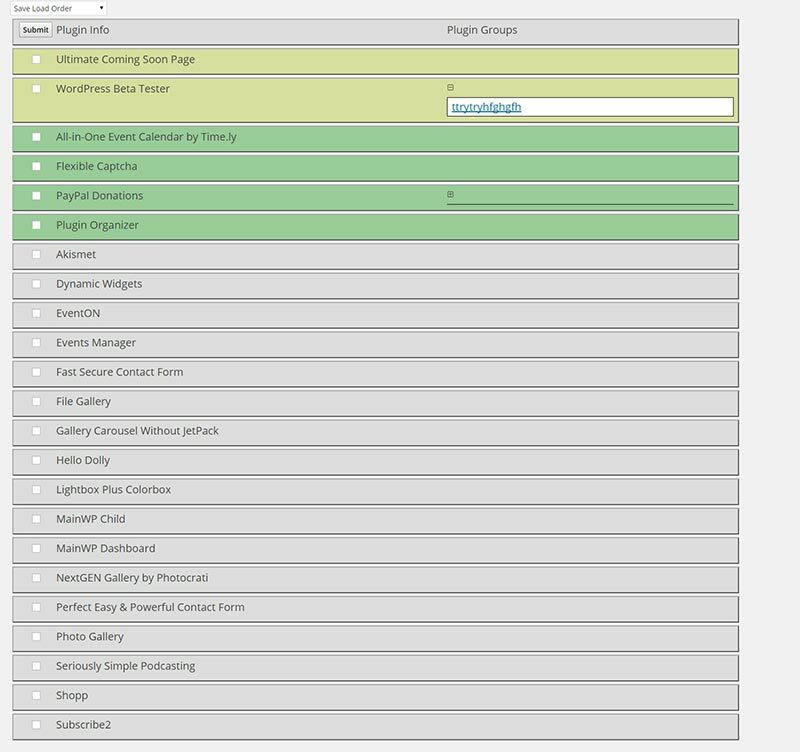 This is a screenshot of the plugin settings page. You can change the overall behavior of Plugin Organizer here. There are settings for wordpress roles, custom post types, debugging, and more. 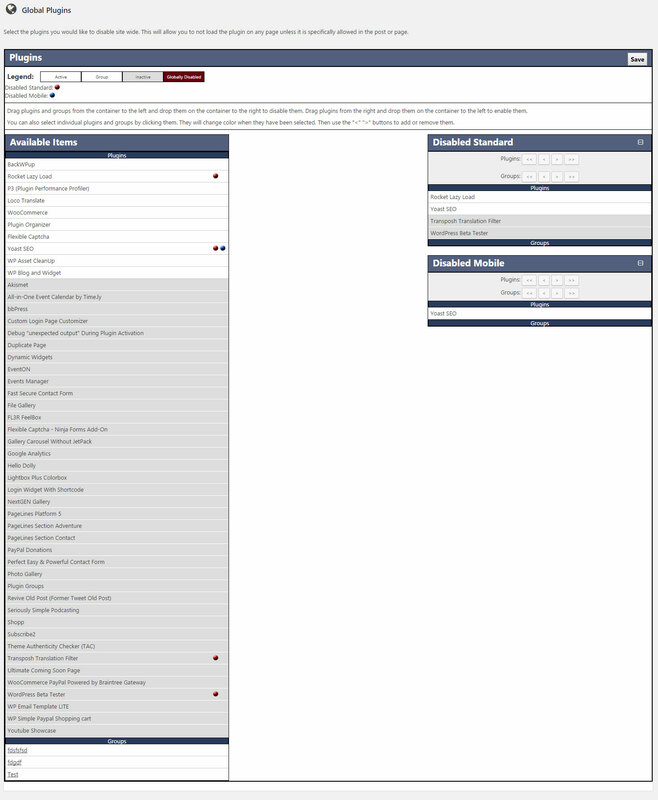 This is a screenshot of the global plugins page. Here you can disable a plugin for the entire site. This allows you to turn it on for just the pages where you need it. Just drag the plugins from the left and drop them on the containers to the right. This is a screenshot of the search plugins page. Here you can set the plugins that will load on the search results page of your site. 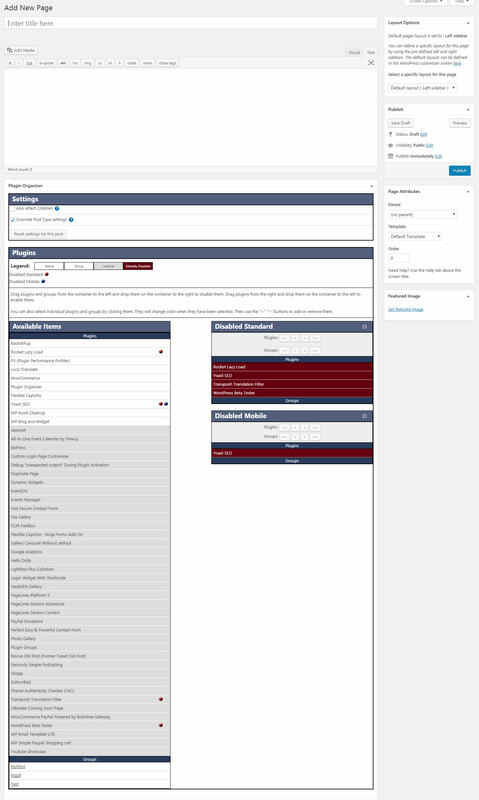 This is a screenshot of the post type plugins page. Here you can set the plugins that will load on all of the posts that match the selected post type. This way you can set all the plugins for posts on one page. 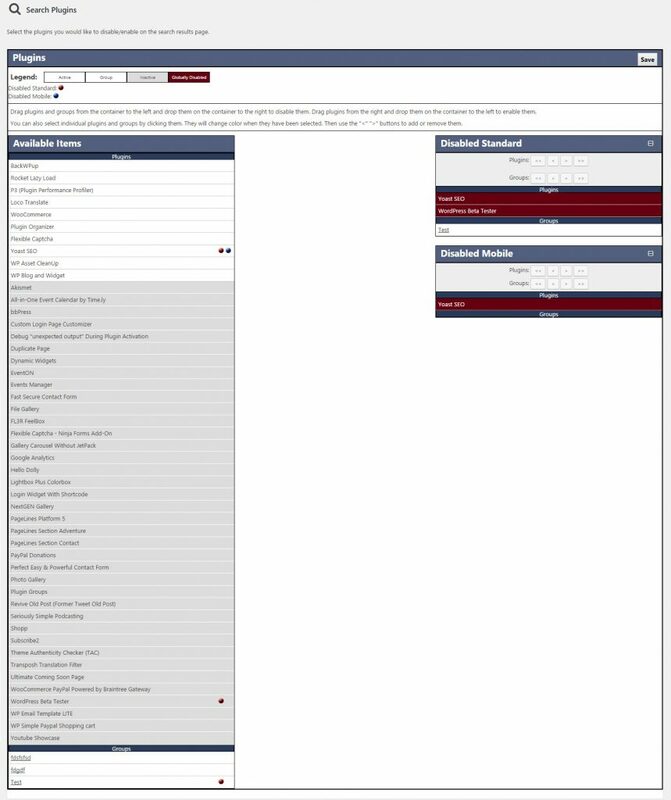 This is a screenshot of the page edit screen. You can disable or enable plugins from here. This meta box will be added to all post types that are selected on the settings screen. I just released version 9.2. It adds a check to the function that tries to get the current user if the second argument is not set. If the current user can’t be retrieved then it should continue without an error. First, I think your Plugin Organizer is a great plugin…. and provides a much needed service… Second, I am getting an error in my logs and was hoping for some insight…. Seems like it’s trying to authenticate a user at some stage and not getting the variable it needs or is asking for something too soon…… . Anyhow, any insight would be a big help…. I was wondering with this plugin is there a way i can change the order that the plugin’s appear on a post page. I have tried to read the comments to see if anyone has asked this and i am just trying to find out the answer. If you can please let me know. You can change the order that they are loaded. Not the order that they appear on the page. Wasn’t aware that 3.71 fixed the issue. Figured there was a major architectural change in WordPress that would have required the plugin to be revamped. Thanks for the update. The new version is going back to using a separate table to store the plugins and I’m thinking of optimizing the queries with hashing. Seems to be working good so far. I’ll probably be able to get it out next week.